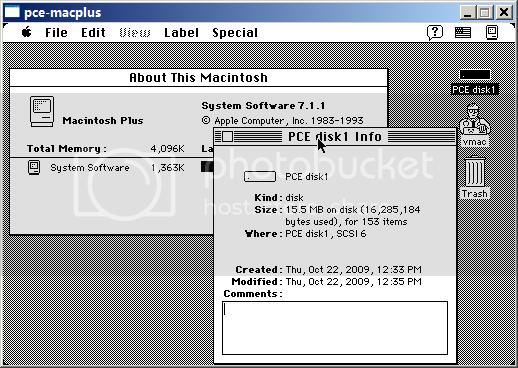 "PCE/macplus is a Macintosh Plus emulator. It emulates a Macintosh 128K, Macintosh 512k, Macintosh 512ke or a Macintosh Plus." I haven't heard of that emulator before. Thanks for the link, ClockWise! Mini vMac doesn't boot some Macintosh System disk images I have found, and I can't submit a bug report because I don't own a Mac Plus. It will be useful to try them in another currently-developed emulator. Compiled PCE/macplus in my MinGW environment with SDL-1.2.13 enabled. It works like SoftMac, however you need to manually edit a config file and use a console to configure it. Unlike SoftMac, It could boot from Mini vMac/BasiliskII/Sheepshaver disk image, however you need to wait for the SCSI scan before PCE could even find the Mini vMac/BasiliskII/Sheepshaver disk. pce also uses direct mouse emulation, ignoring windows mouse settings. That way, the mac os mouse settings work perfectly! I got a recent version of this emulator, and it appears to work great, however I can't figure out how to add to the disk images or get it to accept my mniivmac disk images. My disk images are in .dsk format, this emulator uses .img format. The img disks won't open in hfvexplorer. Alternatively if someone can figure out how to get the emulator to read .dsk files that would be nice too. I modified the config file to try to load them but there is some error when it comes time to load the disks. Almost forgot: I am using windows. # Multiple "ram" sections may be present. # The memory block is initialized with this value. IMG to DSK is easy if you're on OSX 10.10 . Install Macfuse and rename both to DMG Now you can read and write it. Once complete then rename DMG back to IMG. That method worked great for me. I have another problem with PCE. Hope, somebody can help me with that. I want to set up serial port redirection on Windows version and was completely confused by PCE syntax. Using same idea on Windows, like \\.\COM3 or \\\\.\\COM3 or COM3, I can't make it working. It's going the other way, but that just involves flipping the < to a > . Forgot to answer this part. DSK, IMG and DMG are container formats, not drive formats. DMG is DiskCopy 6.x -- basically the modern format. IMG is usually DiskCopy 4.3 or NDIF format, and was the standard on the classic Mac for years. DSK is essentially NDIF with the checksum header stripped off -- so it's a raw disk image. Now Disk Utility is set up to handle DMG by default, but recognizes NDIF and other container formats transparently. But then we get to the tricky part: the format of the disk inside the container. Apple has used MFS, HFS and various flavours of HFS+ over the years. The only thing I've found that has let me manage MFS partitions is Mini vMac with an OS that recognizes MFS. MacFUSE was a great solution for handling older partition formats under OS X 10.5/10.6, but is incompatible with 10.7+ -- instead, you have to install OSXFUSE for FUSE support. Unfortunately the hfsfuse plugin is statically linked against MacFUSE and won't work under OSXFUSE -- which means no NDIF HFS support under OS X 10.10. Can't agree with that. It works for me under 10.10, I have both MacFuse and OSXFUSE running. Don't remember how exactly I did this magic, was lazy to document that at a time. But I have completely NO issues with writing to IMG images now at 10.10. Can you please outline what version of MacFuse and fuseHFS you're using? This is something I would dearly like to get working again. And I've tried all sorts of things, including manually compiling fuseHFS as a filesystem plugin. Still won't help with MFS, but Apple hasn't supported THAT in over 25 years. They supported DOS and ProDOS partitions longer than that. ...which of course indicates that I'm getting old It works -- sort of -- with OSXFUSE. PCE got an update in February. It's now at PCE 20170208-df19414. Does anyone have an OS X build kicking around? Hampa only has the source and the Windows builds. Hmm... having said that, it builds pretty easily, and can be dropped into the Windows downloads and run with minimal modifications. I could probably whip up one of my clickable builds if anyone's interested. What is the configure line to be used for Mac OS X as a host? It's possible I didn't enable tun on my builds. Either that, or you don't have the tun/tap libraries installed to build against? I think I've got them installed via homebrew. I am trying to compile pce for my Mac OS X 10.13. I tried two different configurations, which gave me different errors during compilation. Any suggestions on how I can compile pce for my Mac OS X 10.13? I managed to have a clean compilation. The binary seems to be working. However, when I tried to use the ready-made packages it doesn't show any output besides the log . I wonder if someone can make a GUI for it, it looks pretty good.